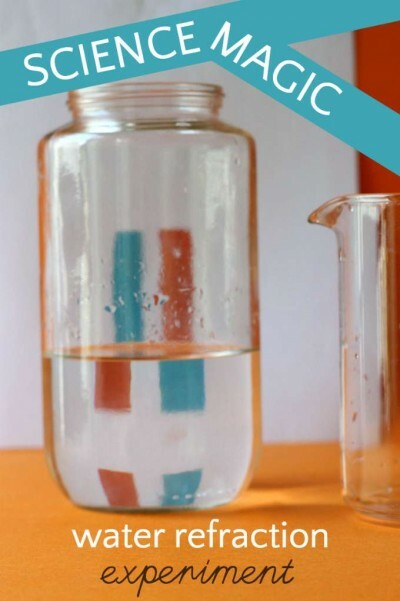 This water refraction science experiment has such a “wow factor” and is so quick and easy I can’t believe my kids and I haven’t done it before. It would fit right in with our DIY science camp series, too. Best of all, there is almost no set up, but once I showed it to the kids, they experimented on their own and debated the reasons for the results. You have the option of setting up the science experiment as we did, or doing it right now with the glass of water sitting next to you! A paper with a design on it. If you wish, you can download and print our printable. It is two pages and includes the colored bars and two arrows facing the same direction. Place a jar or glass about 6 inches in front of the colored bars or arrows. Pour in the water. What happens? 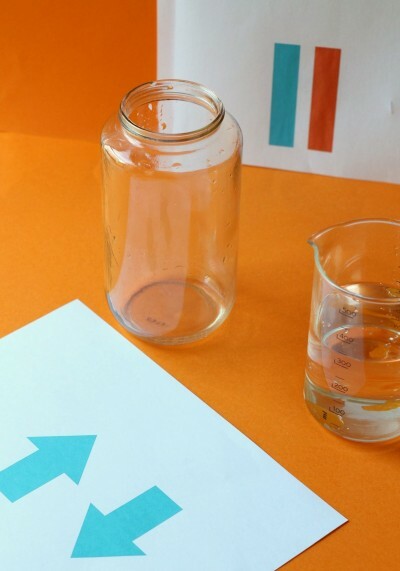 Ask your kids to keep their eyes on the bars/arrows as you slowly pour the water into the jar. I told my kids I had a magic liquid. I’m pretty sure my 6 year old believed me, but my 10 year old unconvincingly said, “It’s water, mom.” But then after I performed the experiment, he said, “Now try it with water.” Ha! So I guess I did fool him. Does it make a difference how close the water is to the paper? Does it make a difference if the jar is square or round? What about the size of the jar or glass? Super nerdy kids (I say that with love) can learn more about refraction of light here. Refraction is the bending of light. 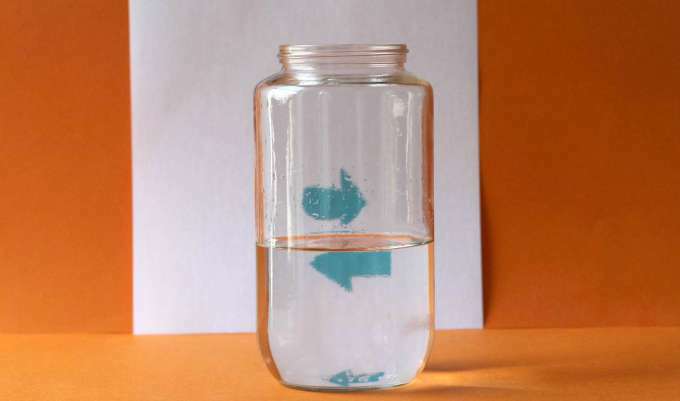 In this case, light traveled from the air, through the front of the glass jar, through the water, through the back of the glass jar, and then back through the air, before hitting the picture. Whenever light passes from one medium into another, it refracts. 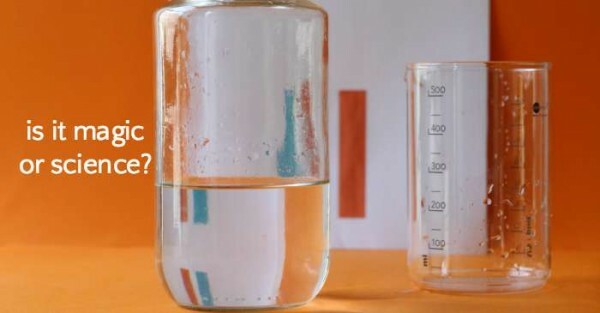 Want another cool and magical water experiment? Find out how to make a coin jump from a bottle. Or find more fun indoor water activities for kids. we filled the glass half with water and put the arrow behind the glass and when we moved the arrow to a particular distance behind the glass it makes the arrow look like its going the other way. When light passes from one material to another, it can bend or refract. In the third experiment before hitting the arrow light traveled from the air, through the glass, through the water, through the back of the glass, and then back through the air. Anytime that light passes from one thing into another, it refracts. When light went through the glass the light bent toward the center. That’s where the light all came together this is called the focal point, but beyond the focal point the image reversed because the light rays that were bent pass each other and the light that was on the right side is now on the left and the left on the right and that is what makes the arrow looks reversed.